Frederic Cambus d48428c03e Add ASCII characters screenshots for all sizes. Each size is provided in the Glyph Bitmap Distribution Format (BDF), and release tarballs contain the fonts in the following formats: PCF, PSF (for the Linux console), and .dfont for Macintosh users. All font sizes contain all ISO/IEC 8859-1 characters, except for the 5x8 version which only contains printable ASCII characters due to character size constraints. The font name is a reference to Baudelaire. The following screenshots show Spleen 16x32 displaying code and prose. Clone the repository, convert the files to the Portable Compiled Format (PCF) using bdftopcf and run mkfontdir in the directory. macOS users should use the provided .dfont file containing all sizes. Release tarballs provide PSF files for each size, setfont can be used to load and set the desired font. Configure the terminal application to use Spleen, and make sure anti-aliasing is disabled. 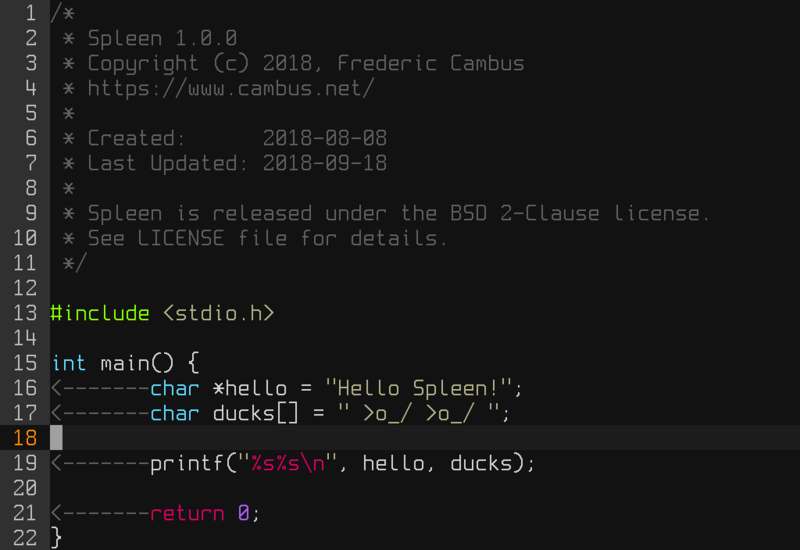 Spleen is released under the BSD 2-Clause license. See LICENSE file for details. Spleen is developed by Frederic Cambus.